Dream and Reality Become One! Strange happenings are afoot as a world very unlike your own begins to bleed into reality. Many who dream are hounded by nightmares of an inky-black darkness creeping silently across the skies. Others slip quietly into a deep sleep from which they will never wake. The fabric of reality and reason is quickly coming apart at the seams. You and a handful of brave souls are all that stand between humanity and the endless void. 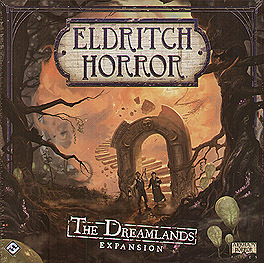 The Dreamlands expansion brings the Dreamlands side board into the fold, opening strange portals that lead from the waking world to the land of dreams. Eight courageous new investigators join the cast of heroes who would defend the world against ever-increasing danger, joined by such stalwart allies as the enigmatic Randolph Carter. Bring mind-warping spells, awe-inspiring talents, and reality-defying artifacts to bear against the might of the Ancient Ones. Descend the steps of slumber to the Enchanted Wood and into the fantastical realm of the Dreamlands!